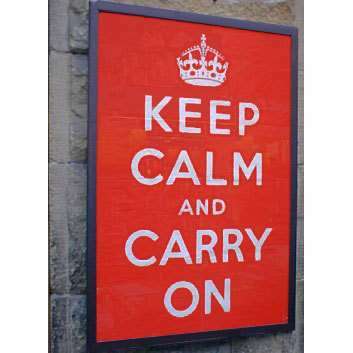 The iconic “Keep Calm and Carry On” poster has recently been revived from its British, Second World War roots. This poster was originally designed by the British Ministry of Information and was intended to boost the morale of British citizens in case of a severe wartime incident such as an air raid. Interestingly, although 2.5 million copies of the “Keep Calm and Carry On” poster were printed, it was never actually displayed. By the end of the war, a majority of the posters were destroyed. Only a handful of posters are known to have survived. Some are available to view in museums, but one poster is owned by Stuart and Mary Manley, the owners of a second-hand bookshop in Northumberland, England called Barter Books. The Manleys discovered the poster folded up in the bottom of a box of books that they purchased at an auction. They loved the design of the poster, and hung it for display in their shop. Because their customers enjoyed it so much, the Manleys decided to make copies of the poster available for sale. The British Government’s Crown copyright, which provides specific protection for government works, has a 50-year duration for published works. The Manley’s prints were therefore legal since the poster had been in the public domain for many years. The Manleys chose not to file for trademark protection of their print. They only asked that anyone who copied the work credit the Manleys. The prints became popular in England, and then worldwide, and many other printers saw the opportunity to copy the design and sell their own version of the product. A search on Etsy, a website that sells handmade items, shows 4,256 items identified with the tag “Keep Calm and Carry On,” many with variants of the tagline (such as “Keep Calm and Rock On” and “Now Panic and Freak Out”) printed on posters, mugs, and other small items. The kink in this charming story occurred this past spring. In March, Mark Coop obtained a European Union trademark for the phrase “Keep Calm and Carry On,” after Coop’s application for a UK trademark was denied. 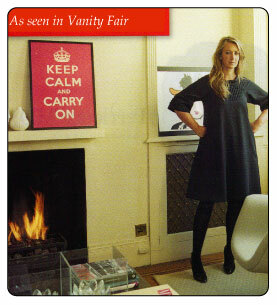 In 2007, after purchasing a copy of the poster from the Manleys, Coop began selling “Keep Calm and Carry On” products online at keepcalmandcarryon.com. Coop also began enjoining his competitors from selling similar items once the EU trademark application was approved. Because of Coop’s actions, many people’s businesses have been affected, resulting in backlash against Coop. Trade Mark Direct, a trademark registration company, has even filed an application to invalidate Coop’s trademark, claiming that the public does not associate the phrase as an indicator of origin for any of Coop’s merchandise. Recently, Coop has applied for a United States trademark as well. We should know the results of the trademark claims in a few months. But until then, keep calm and well, you know. The feature photo is The Manleys in their shop, Barter Books, with the original poster. Emily T. Wolf is a third year student at Fordham University School of Law. She grew up in North Dakota and graduated from the University of Minnesota with a degree in biology. She hopes to pursue a career in advocating for reproductive justice.